Shrewsbury Town have signed Aldershot defender Darren Jones after he turned down the offer of a new deal at the Recreation Ground. 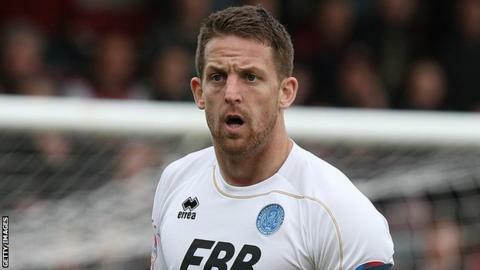 The 28-year-old Welshman, who was previously signed by Town boss Graham Turner for Hereford United, left Edgar Street for the Shots in 2010. Jones, appointed club captain by Aldershot last summer, was named as the club's 2011-12 player of the season. "He's a very good defender. He's very strong and aggressive," said Turner. "He's got enough mobility and pace about him to deal with strikers in League One." Jones, whose Shots contract expires on 30 June, will become Turner's third signing of the summer, following the arrival of midfield men Asa Hall (Oxford United) and Aaron Wildig (Cardiff City). But they have lost skipper Ian Sharps to Rotherham and Shane Cansdell-Sherriff and Nicky Wroe to Preston. "Having lost our central defenders Ian Sharps and Shane Cansdell-Sherriff we are delighted to have brought in Darren and I think he'll do a good job for us," Turner told the club website. "It will be a new experience for him at this level, having played in the Conference and then League Two for Hereford and Aldershot. "Whenever I saw him play last year he put in good performances and, in the view of the Aldershot supporters, he had a good season because he swept the board with their player of the year trophies." Newport-born Jones, who began his career at Bristol City, also played for Forest Green Rovers, Cheltenham Town (loan) and Newport County.